NOTIFICATION: Institute of Banking Personnel Selection (IBPS) (A Government of India Undertaking) inviting online applications for filling up 1599 vacant posts of Specialist Officers’ in various public sector banks and other participating organisations through Common Recruitment Process (CRP SPL – VIII) in various disciplines tentatively conducted in December 2018 from eligible and interested willing candidates. It is latest & good information for unemployed personnel those who are looking for these new Jobs in Government sector & other organizations. Job seekers, who wish to apply for these vacancies regarding IBPS SO Recruitment 2018, must have passed Graduate/Post Graduate in concerned discipline with a required experience if asked. Applicant’s upper age should be as per Govt. rules and age relaxation is applicable to all reserved category candidates i.e.SC/ST/ OBC/PWH /Ex Servicemen/Women candidates etc. NO OF POSTS: 1599 vacant posts of Specialist Officers in I.T. Officer (Scale-I), Agricultural Field Officer (Scale-I), Rajbhasha Adhikari (Scale-I), Law Officer (Scale-I), HR/ Personnel Officer (Scale-I), Marketing Officer (Scale-I) disciplines through Institute of Banking Personnel Selection (IBPS). 1. I.T. Officer (Scale I): 219 Posts. 2. Agricultural Field Officer (Scale I): 853 Posts. 3. Rajbhasha Adhikari (Scale I): 69 Posts. 4. Law Officer (Scale I): 75 Posts. 5. HR/Personnel Officer (Scale I): 81 Posts. 6. Marketing Officer (Scale I): 302 Posts. 6. Central Bank of India. 11. Oriental Bank of Commerce. 12. Union Bank of India. 16. United Bank of India. 19. Punjab & Sind Bank. 1- I.T. Officer (Scale I): A passed of 4 year Engineering/ Technology Degree in Computer Science/ Computer Applications/ Information Technology/ Electronics/Electronics & Telecommunications/ Electronics & Communication/ Electronics & Instrumentation OR Post Graduate Degree in Electronics/ Electronics & Tele Communication/ Electronics & Communication/ Electronics & Instrumentation/ Computer Science/ Information Technology/ Computer Applications OR Graduate having passed DOEACC ‘B’ level from any recognized Institute/University with required experience in relevant discipline. 2- Agricultural Field Officer (Scale I): A passed of 4 years Degree (Graduation) in Agriculture/ Horticulture/Animal Husbandry/ Veterinary Science/ Dairy Science/ Fishery Science/ Pisciculture/ Agri. Marketing & Cooperation/ Co-operation & Banking/ Agro-Forestry/Forestry/ Agricultural Biotechnology/ Food Science/ Agriculture Business Management/ Food Technology/ Dairy Technology / Agricultural Engineering/ Sericulture from any recognized Institute/University with required experience in relevant discipline. 3- Rajbhasha Adhikari (Scale I): A passed of Post Graduate Degree in Hindi with English as a subject at the degree (graduation) level OR Post graduate degree in Sanskrit with English and Hindi as subjects at the degree (graduation) level from any recognized Institute/ University with required experience in relevant discipline. 4- Law Officer (Scale I): A passed of a Bachelor Degree in Law (LLB) and enrolled as an advocate with Bar Council from any recognized Institute/ University. 5- HR/ Personnel Officer (Scale I): A passed of Graduate and 2 years Full time Post Graduate degree or Two Years Full time Post Graduate diploma in Personnel Management / Industrial Relations/ HR / HRD/ Social Work / Labour Law from any recognized Institute/University with required experience in relevant discipline. 6- Marketing Officer (Scale I): A passed of Graduate and 2 years Full time MMS (Marketing)/ 2 years full time MBA (Marketing)/ 2 years Full time PGDBA / PGDBM/ PGPM/ PGDM with specialization in Marketing from any recognized Institute/University with required experience in relevant discipline. PAY SCALE: As per Govt. rules. AGE LIMIT: Candidate’s required age should be in between of 20 years - 30 years as on 01-11-2018 (i.e. the person must not have been born earlier than 02.011.1988 and not later than 01.11.1998 – both dates inclusive) for IBPS Specialist Officer Exam 2018- 2019 SO Recruitment Notification. REQUIRED APPLICATION FEE: For said vacancy a non- refundable application fee is to be paid by the candidates as per rules. An amount of Rs.100/- by SC/ ST/ PWD/ EXSM candidates and Rs.600/- by General & OBC candidates to be paid through online by using Debit Cards (RuPay/ Visa/ Master Card/ Maestro), Credit Cards, Internet Banking, IMPS, Cash Cards/ Mobile Wallets. छत्तीसगढ़ पब्लिक सर्विस कमीशन ने विभिन्न १६० कॉमर्सिअल टैक्स इंस्पेक्टर, एक्साइस सब इंस्पेक्टर तथा अन्य पदों हेतु विज्ञापन जारी किया है। इच्छुक उम्मीदवार यहाँ आवेदन कर सकते हैं, आवेदन करने से पहले पूरी जानकारी यहाँ पढ़ें – 160 vacant posts of Excise Sub Inspector, Commercial Tax Inspector and others through Chhattisgarh Public Service Commission (CGPSC), Raipur. LAST DATE TO APPLY: From 07-12-2018 to 05-01-2019. SELECTION PROCESS: Applicants who are screened for applicability/ eligibility are being selected as per organization policy/rules depending on the basis of their performance in preliminary and main examination followed by an interview. IBPS Exam Pattern for Specialist Officer: The exam pattern helps the candidates to prepare in a right direction. There will be two exams i.e. Prelims and Mains and candidates need to clear both which are off objective types. For every wrong answer there will be a negative marking in the exam i.e. 0.25 marks will deduction. IBPS SO Preliminary Exam pattern: In this IBPS So Pre-Exams, there will be 150 Multiple Choice Questions and each question carry each mark and duration will be only 02 hour to attempt all those 150 questions. NOTE: After the success of both Pre and Mains Examination, candidates need to clear the last and final round i.e. interview. Candidates who have been shortlisted in the Main examination for CRP SPL-VIII will subsequently be called for an Interview to be conducted by the Participating Organizations and coordinated by the Nodal Banks in each State/UT with the help of IBPS. Interviews will be conducted at select centres. The centre, address of the venue, time & date of Interview will be informed to the shortlisted candidates in the call letter. • On-line registration including edit/modification by candidates: 06-11-2018- 26-11-2018. • Payment of fees/intimation charges (online): 06-11-2018- 26-11-2018. • Download of call letters for online exam, Preliminary: December 2018. • Online examination – Preliminary: 29-12-018 and 30-12-2018. • Result of online Exam – preliminary: January 2019. • Download of call letter for online Exam – Main: January 2019. • Online examination – Main: 27-01-2019. • Declaration of result of online Main exam: February 2019. • Download of call letters for interview: February 2019. • Conduct of Interview: February 2019. • Provisional allotment: April 2019. HOW TO APPLY: For said posts (IBPS Specialist Officers Recruitment 2018 for 1599 Posts Apply Online) eligible, willing and interested candidates may apply through online at official website up to last date. Applicants must retain a hard copy for future reference. 5. Link for Online Application & Fee Payment will be available till up to 26-11-2018. 6. Candidates need to take a Print out of filled Application Form for future Reference. CONTACT ADDRESS: Institute of Banking Personnel Selection (IBPS). CONCLUSION: Institute of Banking Personnel Selection (IBPS) invites online application for the recruitment of 1599 vacant posts of Specialist Officers in I.T. Officer (Scale-I), Agricultural Field Officer (Scale-I), Rajbhasha Adhikari (Scale-I), Law Officer (Scale-I), HR/ Personnel Officer (Scale-I), Marketing Officer (Scale-I) disciplines on regular basis from Indian residents who are eligible & interested; candidates can apply through online application. 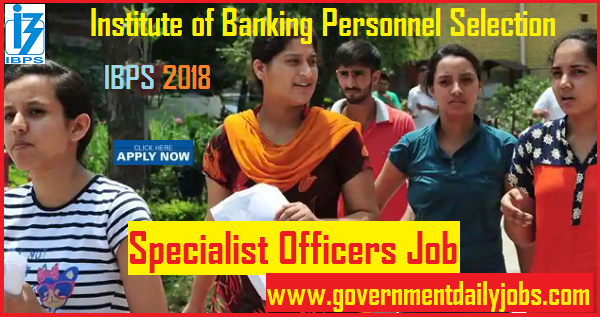 IBPS 1599 SO Recruitment 2018: Institute of Banking Personnel Selection (IBPS) is going to conduct Common Recruitment Process (CRP) for selection of personnel in Specialist Officers. So people who are interested in the Bank Jobs can utilize this opportunity by apply for the IBPS SO Recruitment 2018 before the mentioned last date which is 26th November 2018. According to the data given in the advertisement, candidates can actually apply up to 26th November 2018. All the details are given in the present article/post. So it is clearly given in the IBPS SO Recruitment 2018 Notification, that the people are going to be chosen for the 1599 Specialist Officers vacancies based on the performance and other affecting criteria’s that will be considered. Basically, the Officials of the IBPS has mentioned that applications will be accepted from the contenders on the behalf of this Employment News, only if they are fulfilling all the qualifications that are clearly instructed in the advertisement which we have given in this article. LAST DATE TO APPLY: From 06-11-2018 to 26-11-2018 for IBPS Recruitment 2018 Apply Online SO 1599 Job Vacancies.